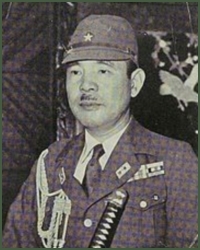 Hara had served as chief of staff with Shanghai Expeditionary Army during the conquest of Shanghai in 1937. By the time war broke out in the Pacific, he was a lieutenant general in command of 35 Division. He commanded 16 Army at Batavia from 1942-1945, and was responsible for setting up an Independence Preparation Study Board in 1945 in an effort to appease Indonesian nationalists. He was recalled to Japan in 1945 to command 55 Army for the final defense of the homeland. Harada had been involved in opium trafficking in China and was hanged as a war criminal for the summary execution of three Allied airmen.